More than a cheque writer, ChequeSystem provides a complete cheque printing and management solution. You are no need to write any, just print and sign it. ChequeSystem provides comprehensive chequebook management. All issued cheques are kept in records. You can review all the issued cheque at anytime you want. Account report and payee report provides complete cheque issued history on bank a/c and payee. 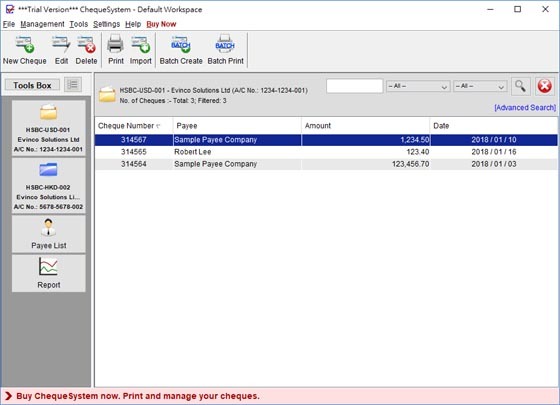 The Cheque Summary can be exported into HTML/Excel/PDF format. You can download cheque templates from server or use built-in design tools to arrange cheque layout. ChequeSystem provides batch printing function and supports different types of printers, Laser, Inkjet, and Dot-Matrix printers. Express Accounts Plus Professional Accounts and Bookkeeping for small business.